"This is a super serious cutter (it can cut through a ream of paper like butter). We lovingly call it 'The Guillotine.' It’s stored in a very out of the way place so that no one accidentally wanders in and cuts off fingers. The machine was built before safety was invented." 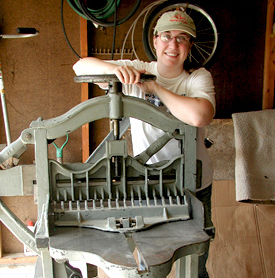 Beagle and Wolf Books & Bindery offers bindery services! 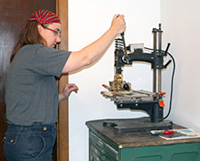 Bookbinder Jen can repair your book or build a book for you out of loose pages. Jen learned the trade under book binder David Farkell (Prairie Book Binder) of Detroit Lakes, MN. 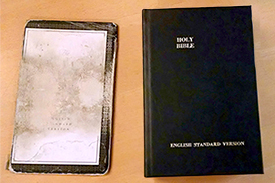 The most common books that Jen repairs are Bibles and cookbooks. imprinting up to 30 letters. extra imprinting: 15¢ a letter. Other available services include doing research/book valuation for $10 an hour (at ¼ hour increments). Spiral binding is not currently available. Go to The Bindery Project, Beth Golay's description of her experience with Jen including slide shows of the steps in repairing a book. or by phone: (218) 237-2665. 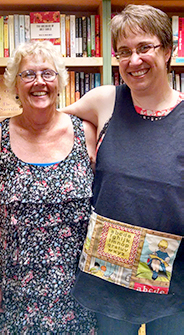 Brenda surprised Jen with this bindery apron! "A book I’m working on has beautiful writing in it. 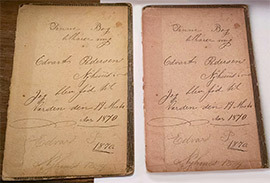 Unfortunately, the writing shown in the picture will get covered up in the process of repairing the book, so I photocopied the original onto card stock and I will make it part of the finished book." Beagle Books has added another B to its title: Bindery. 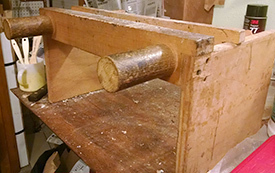 When Geraedts became interested in book repair, she researched sources to learn the process. A literary center in Minneapolis was offering classes, but she hoped to find a local person to serve as her tutor. She found David Farkell of Detroit Lakes, ironically via Google. She called him in February. “David was in love with the printed word,” Geraedts said. The journalism graduate had worked as a reporter, college professor and, at 82, the Prairie Bookbinder. Farkell agreed to tutor her, come summer. But after meeting six times, he died, with some skills yet to be shared. 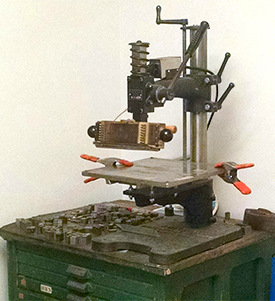 Shortly after his death, Farkell’s family called and offered to sell Geraedts the equipment—including an 1899 guillotine (for cutting pages), hundred of pounds of lead letters, antique irons that act as weights, a hot stamping press, other presses originating in West Germany, book cover fabrics and a drawer with 41 “oops.” “I’ve made one contribution so far,” Farkell’s protégé said of the drawer of errors. To date, Geraedts has resurrected a dictionary, atlas and a book of poetry, that’s been part of a family for decades. “I love people sharing a piece of family history.” But she’s not yet built the confidence to tackle heirloom Bibles. That’s likely to be after tutelage from a former Farkell student in Alexandria. “I think he may have planned to sell me the equipment,” Geraedts said of a realization after his death. “He was worried the craft was disappearing,” she said. “He was hoping someone would pick up the reins. “When I run into snags, I yell ‘help,’” she said of the void created by his death. But then she recalls his foremost advice: “Patience.” And she waits for the glue to dry. Geraedts discussed this at meetings with art friends and book groups and after conversations with them she realized that she should check this coincidence out. “I looked into where I could take a class in book bindery and The Loft in Minneapolis was the only place I knew of,” said Geraedts. “But it was too far. I couldn’t get down there and back in a day’s time.” “I did more research and found Prairie Book Bindery in Detroit Lakes, so I Googled it,” explained Geraedts. “All I found was the company name, no Website, just the owners name, David Farkell - this made me a bit leary. Farkell explained to Geraedts that he didn’t teach formal classes, but that he would mentor her in his shop in Detroit Lakes. This seemed more do-able than the haul to Minneapolis. “He was a wonderful teacher—patient and complimentary. If I messed up he would gently tell me how to fix it,” said Geraedts. Unfortunately, after six sessions, Farkell had a heart attack and aneurism and died in July of complications, leaving a void in Geraedts learning the art of book binding. “I didn’t know what I was going to do. It was like starting over,” said Geraedts. “So, I made another cold-call to Dan Robards in Alexandria. Dan had worked with David, so I hoped he would finish teaching me what I started with David.” Robards agreed, and this fall Geraedts will finish her apprenticeship. She has learned how to build books, glue and sew books. She now will learn the art of re-binding and repairing books. In August, Geraedts and her father drove to Detroit Lakes and brought back most of the business except for the “guillotine,” (a type of cutting machine for trimming the edges of books). Geraedts and her husband returned for the piece of equipment that weighs approximately 400 pounds. With all of the parts waiting to be set up, Geraedts hopes to have the business up and running in the basement of Beagle Books by the end of September. The new business will be called Beagle Books and Bindery. “This has been such a journey, and once I’m finished, I just hope that someone will trust me with their book like they did David,” said Geraedts.